Professor Dowell's principal teaching interest and research activity is in the field of aeroelasticity - which is the study of the dynamic interaction between an aerodynamic flow and an elastic structure, such as aircraft wings in high speed flight, long span bridges and tall buildings responding to wind loadings, or airflow through the mouth and lungs. 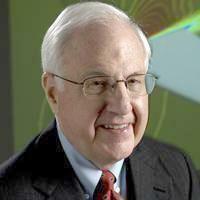 Dr. Dowell has also done research in acoustics, nonlinear dynamics, structural dynamics, and unsteady aerodynamics. Professor Dowell's major research accomplishments include the first definitive research monograph on the aeroelasticity of plates and shells, the first derivation and solution of the nonlinear equations of motion for a helicopter rotor blade (the Hodges-Dowell equations), and work with Professor Kenneth Hall and several graduate students and post-doctoral fellows on reducing the dimensions of mathematical models for very complex high-dimensional fluid/structural systems. Professor Dowell teaches undergraduate and graduate courses on dynamics and aeroelasticity. Here are seven short videos showing experimental aeroelastic models undergoing limit cycle oscillations in the Duke wind tunnel. An airfoil with a nonlinear freeplay in the connection from the main airfoil to the trailing edge control surface. A delta wing with a strong structural nonlinearity as a result of tension in the mid-plane of the plate-like wing induced by bending of the wing out of its initially undeformed plane. A very high aspect ratio wing that behaves as a beam with double bending (both transverse to and in-line with the aerodynamic flow field) and twisting. A nonlinear coupling among double bending and twisting occurs. Also the aerodynamic flow field experiences separation due to the large motions involved. A delta wing with an external store, flutter and limit cycle oscillations. LCO of Cropped Delta Wing In the video you will see a cropped delta wing (that simply means we cropped off that would otherwise be a delta or triangular wing). The wind speed in the wind tunnel is shown by the dial in one of the frames. In the other two frames you see signals from two strain gauge bridges, bending and torsion, and of course the wing itself. The wind speed at which flutter is predicted to occur theoretically is about 19 meters/second. The experimental flutter speed based on observation of the strain gauge signals is about 21 meters/second. Note that at the wind speed when flutter starts, both strain gauges show dominant response at a frequency of 12 Hz. This large peak at a single frequency is a characteristic identifier of flutter. Also note that the motion of the wing is not easily visible to the eye until a higher wind speed in the range of 24-26 meters/second and the motion is most visible at the wing tip. Once the flutter speed is exceeded, limit cycle oscillations occur due a strong structural nonlinearity. Aeroelasticity, acoustics, nonlinear dynamics, structural dynamics, and unsteady aerodynamics. Lee, MW; Dowell, EH; Balajewicz, MJ, A study of the regularized lid-driven cavity's progression to chaos, Communications in Nonlinear Science and Numerical Simulation, vol 71 (2019), pp. 50-72 [10.1016/j.cnsns.2018.11.010] [abs]. Tang, DM; Levin, D; Dowell, EH, Experimental and theoretical correlations for energy harvesting from a large flapping flag response, Journal of Fluids and Structures, vol 86 (2019), pp. 290-315 [10.1016/j.jfluidstructs.2019.02.018] [abs]. McHugh, KA; Dowell, EH, Nonlinear Response of an Inextensible, Cantilevered Beam Subjected to a Nonconservative Follower Force, Journal of Computational and Nonlinear Dynamics, vol 14 no. 3 (2019) [10.1115/1.4042324] [abs]. Wei, Y; Dowell, EH; Chen, Z, Numerical prediction of impact of clearance on rotordynamic coefficients for labyrinth brush seal, International Journal of Turbo and Jet Engines, vol 36 no. 1 (2019), pp. 31-43 [10.1515/tjj-2016-0065] [abs]. Modaress-Aval, AH; Bakhtiari-Nejad, F; Dowell, EH; Peters, DA; Shahverdi, H, A comparative study of nonlinear aeroelastic models for high aspect ratio wings, Journal of Fluids and Structures, vol 85 (2019), pp. 249-274 [10.1016/j.jfluidstructs.2019.01.003] [abs].